Why not listen to Seamus Heaney reading this lovely poem himself? I think of it every autumn when I’m picking blackberries! Of course, the only way to stop the blackberries rotting is to use them immediately or freeze them.But before you opt for the traditional blackberry and apple pie again, check out these delicious alternative blackberry recipes. This recipe is quick and easy to make, although you have to allow time for it to freeze. I like the effect of the blackberries swirling through the dessert, so I wouldn’t over-mix it. Serve it in tall sundae glasses with a blackberry and sprig of mint on top. Home-made shortbread would make this dessert even more tasty! Kids will love these at any time of the year and it’s easy to find ice pop kits online. It only uses store-cupboard ingredients and they’re simple to make. The rosewater adds a lovely fragrance but you could leave it out if your children aren’t keen on it. This recipe is a different take on the traditional blackberry and apple pie. It’s a superb winter warmer, but remember it takes around 90 minutes to cook, so plan well ahead or cook and freeze it. The addition of ground ginger gives this dessert a little kick too! Forget soggy trifle with tasteless sauce. This gourmet version combines gorgeous flavours with a beautiful blackberry sauce, and it looks as good as it tastes. You could cut corners and use shop-bought ginger cake and lemon curd if you’re pushed for time. This recipe is good enough for entertaining! This traditional pudding is light and tart – everything a blackberry dessert should be! It’s easy to make and only needs a little time to assemble, but you’ll have to leave it in the fridge for several hours (or overnight) so plan well ahead. You could serve this with clotted cream as an alternative to double (heavy) cream. 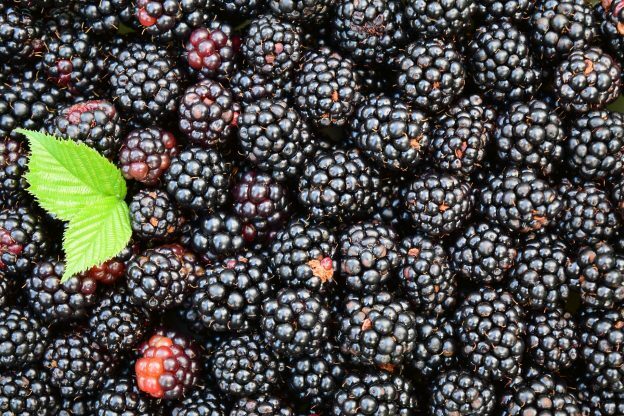 Blackberries work just as well in savoury recipes and their sharpness makes them a wonderful accompaniment to stronger tasting foods such as game or ripe cheese. This makes a tasty light lunch – the pairing of blackberries and salty feta cheese is a match made in heaven. Sprinkle a few walnuts in for extra crunch. Another super lunch idea – rather like a deconstructed pizza! These sandwiches give a different twist on the more common brie and cranberry variety, combining fontina cheese with blackberries. Artisan bread works best with this – you could even make own! Nothing tastes as delicious as home-made pizza. This version with creamy ricotta and tangy blackberries, topped with basil, gives a truly innovative taste. Again, home-made pizza base works best, so perhaps make enough bread for this and the fontina sandwiches in one go. Either recipe will freeze well. Red cabbage is a staple in our house at Christmas, but I’ve never thought of cooking it with blackberries. This would make a great alternative to a Sunday roast dinner, and you could swap the venison for another red meat such as steak for a change. The braised cabbage would probably freeze well too. For a quick and delicious mid-week meal, this chicken dish definitely fits the bill. The sharpness of the balsamic combines beautifully with the blackberries to create a lovely glaze – you could make and freeze ahead of time for even more convenience. In fact, the whole meal could be cooked and frozen. Of course, blackberries give a creative burst of colour to any smoothie, but don’t limit their use to juices. This combination of autumn berries makes a great alternative to more traditional blackcurrant cordials. You can make this syrup using wild berries or use frozen ones, and despite the measurements given, you could play with the actual amounts, or even use exclusively blackberries. This keeps well in the fridge and will soon be a firm favourite with the kids. Perfect for a party, or just relaxing with the family, this non-alcoholic punch is delicately coloured and has a sparkling fizz. The recipe combines blackberries and raspberries, but again, you could vary the precise make-up depending on what you have available. This boozy milkshake is a real winner, combining milk, blackberries and a shot of bourbon. Definitely one for the adults! An unusual take on a well-loved classic. The blackberries add a beautiful blush and there’s a hint of lime to give this chilled favourite a little edge. If you’ve ever made sloe gin, then why not try this blackberry liqueur? It’s made by covering blackberries with vodka, then leaving the whole mixture to infuse for several weeks. This liqueur has a stunning colour and would make a fabulous Christmas gift in a decorative bottle. So there you have it – 15 alternative ways to enjoy blackberries. Which is your favourite?